Visit two of Croatia’s most popular destinations in one day: this private driving tour from Split makes getting around a breeze. Following morning pickup from your hotel, travel in a luxury, air-conditioned minivan. Your first stop is the coastal city of Sibenik, where you’ll go for a guided walking tour and will see highlights like the UNESCO-listed Cathedral of St. James. 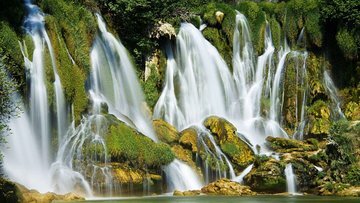 Then, transfer to Krka National Park, where you can get up close and personal with its many waterfalls and turquoise pools.